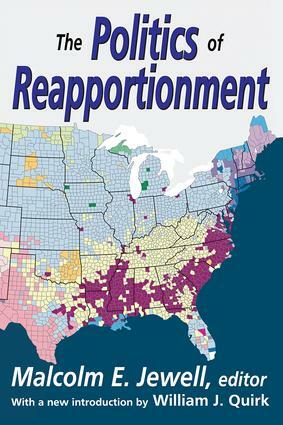 The issue of apportionment is one of the most important problems facing citizens of most of the states in America. It underlies many other problems of state government. Growing judicial concern with apportionment is evidence of a failure of the political process in many states. A political solution to the problem requires better understanding and more accurate information about apportionment, which may be found in The Politics of Reapportionment.Understanding the politics of apportionment may be broken down into four parts: What are the political factors that have caused the various states to follow differing courses in apportionment? What are the political consequences of these differences in apportionment? When a legislature is grappling with any reapportionment problem, what roles are played by the various political groups involved? What are the consequences of transferring this controversy out of the legislative arena?Jewell notes that a study of legislative apportionment is essential to an understanding of any representative system of government. In the U.S. the patterns of apportionment have vitally affected the nature of our state and national political institutions, and our political history has been marked by a number of colorful struggles over this issue. For these reasons, American political scientists have devoted more attention to apportionment than to many other problems of government. Florida: Politics and the "Pork Choppers"
North Carolina: "This Bill or Nothing"
California: "Brutal Butchery of the Two-Party System"?